/ The Best Fishing Hooks: Reeling Them In! 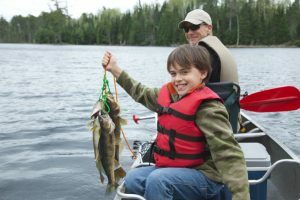 Once upon a time, fishing was more than just a seasonal sport, it was a means of living and a way to put food on the table and eventually inside the belly. 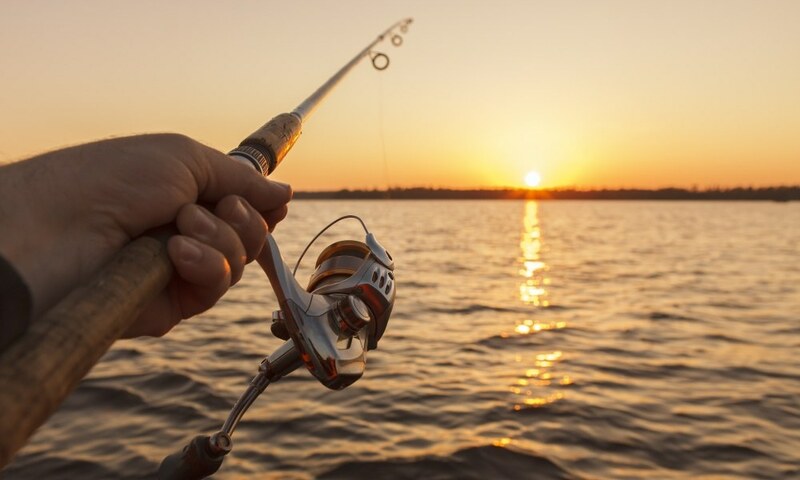 This might still be true to some parts of the globe, but regardless of the purpose, fishing is always a great experience when you are using the best fishing hooks to reel the biggest catch in. 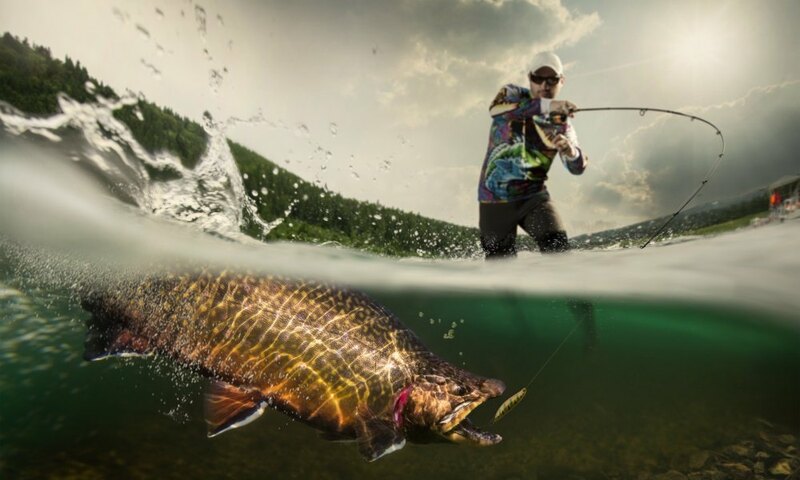 Fishing hooks work in tandem with lures and baits to make sure that fishes continue to flock towards you for a bountiful harvest. 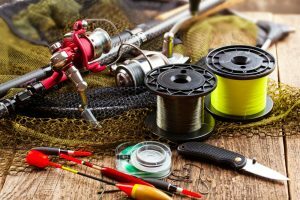 Some of the best angling and fishing hooks not only catch them, but they also ensure that they remain hooked with no chance of escape. There is a little bit more science to fishing hooks than just bending metal and shaping its tail. 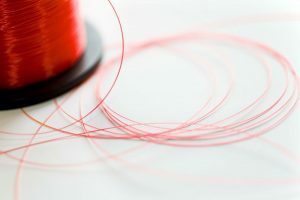 Some fishing companies have come up with new ways of bending it, while some even added new features that promise a better catch. Here are three fishing hooks available on the market now. The Jshanmei Circle Hooks 7384 comes in a 150-piece set of varying sizes; 25 pieces each for sizes #1, 1/0, 2/0, 3/0, 4/0 and 5/0. 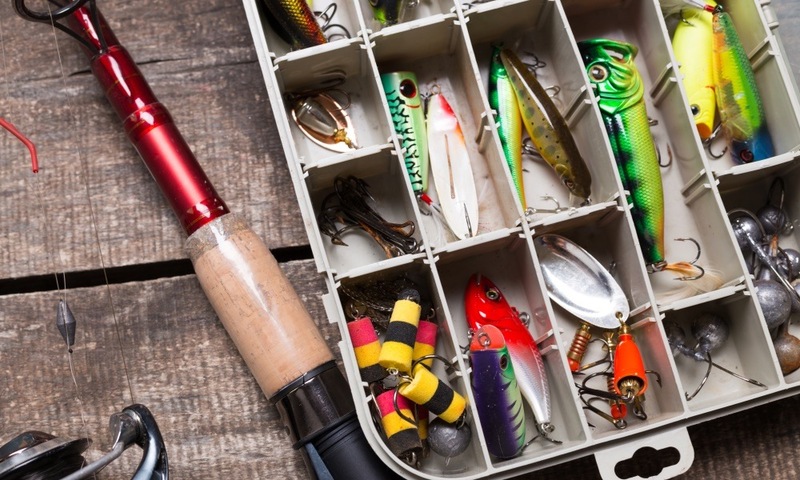 These fishing hooks come in a reusable plastic box for better organization. The 150-piece fishing hook set is made of high carbon steel which guarantees high tensile strength and better corrosion resistance. The hooks come with a circle hook design that decreases the mortality rate of your catch, keeping them alive and fresh. The circular bend, or closed eye, lets you hold on to more fish. Each piece of the set is tested for quality, durability, and strength. The fishing hooks from this set are made of high-quality steel and are sturdy. Each fishing hook feels strong, and the hook tips are very sharp. The Jshanmei Circle Hooks 7384 is ideal for catching small fishes like basses and trouts, but do not use it for bigger fishes like tunas and sailfishes as these hooks were not made for them. The assortment of sizes and the design of these 150 fishing hooks make for an ideal fishing trip companion as they provide versatility when it comes to the kinds of fishes that you can catch. Each fish caught using these fishing hooks stays on the hook, even after all the trashing and the gnashing that fish usually do when caught. 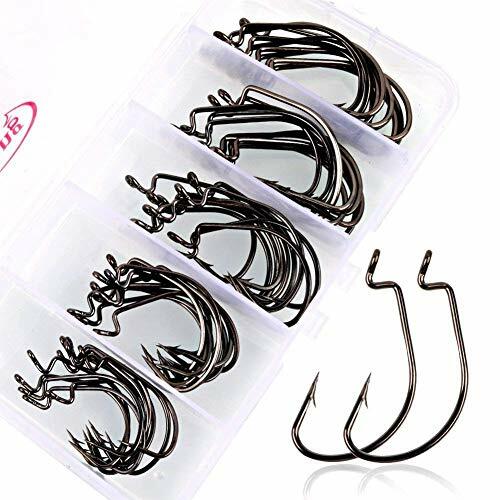 The fishing hooks come in one package, and they are not sorted out by size and are often jumbled up, which can take some time to separate and organize. Some fishing hook tips can become out of shape in time, and you would need to inspect them individually and then perform a tip adjustment. Some eye loops from the set are not closed as they should be which can result in the line sliding out and rendering the hooks unusable. 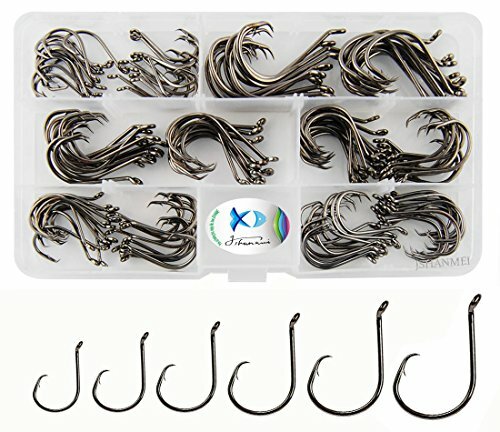 Sougayilang Fishing Hooks comes in a 50-piece package of varying sizes from 2# to 3/0, all of which comes in a reusable plastic box that keeps them separated by size. This plastic box is also compact and can fit right into your back pocket without any problem. 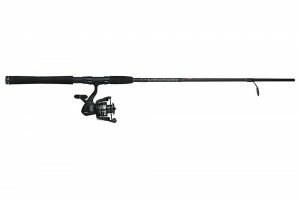 Each piece of the 50-piece set is made of high carbon steel, and it has an offset point design which is ideal for either fresh or saltwater fishing. The extra wide gap of each hook allows for more consistent hookups and adds to the tensile strength of each hook. The special barb hook design decreases the mortality rate of your catch as it locks fish in retreat. This fishing hook is rust-resistant and stays sharp no matter what abuse it takes. The fishing hooks do not seem to bend easily, and they look strong enough to handle small- to medium-sized fishes. 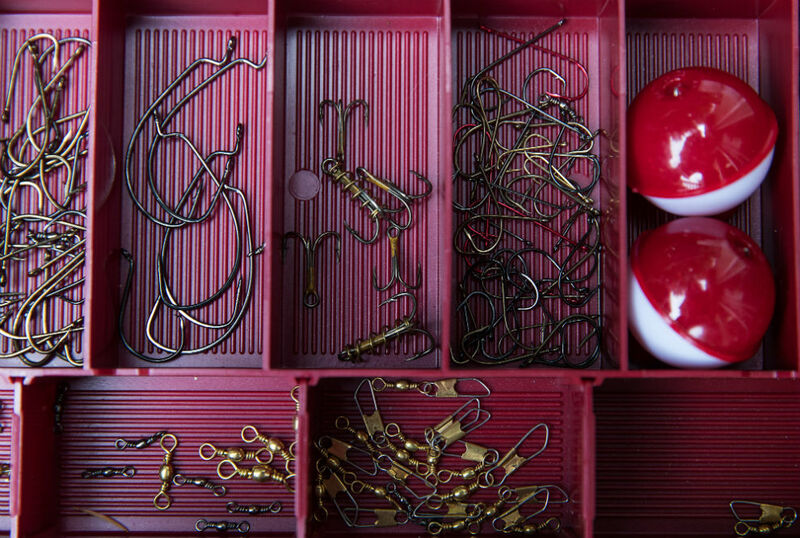 The container that the hooks come in is a nice organizer and fits right into any fish and tackle box. The fishing hook eyes are durable and make attaching lines and swivels to them easy and fast. The fishing hook points are nice and sharp; each of them can hold up well against a thrashing fish. The mix of the large and small fishing hooks are a little unequal and could have contained more of the smaller sizes. 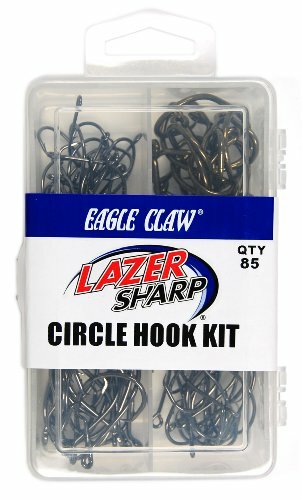 The Eagle Claw Fishing Tackle Co. Lazer Sharp Circle Hook Assortment comes in a set of 85 hooks with varying sizes from 2/0 to 5/0. Each of these fishing hooks has been tested in the field to ensure durability and strength. It also comes in a reusable plastic box that keeps them organized while still being able to fit in your pocket. The Lazer Sharp Circle Hooks are sharp indeed, but their small size belies their effectivity in catching fish. These fishing hooks are ideal for catch-and-release fishing as the hooks ensure a lower mortality rate. The eye of this fishing hook is easy to attach a line to, and it does not let it slide. The sizes included in the Lazer Sharp Circle Hook Assortment can be more diverse as the fishing hooks included are mostly big ones that can’t be used for smaller fishes which is what you would commonly have in rivers and lakes. For its value and the number of features that it has, the Jshanmei Circle Hooks 7384 is the best of the three fishing hooks listed. These hooks are made of high-quality materials and have a high tensile strength which makes them ideal for catching slightly bigger fishes. 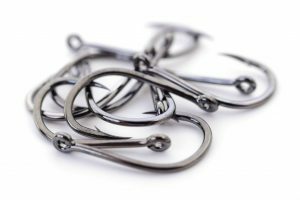 Their hook design and the wide gap add to their durability and strength, and the range of sizes that they come in speaks of versatility in use. Their circle hook design lets you catch fish without killing them while they are still on the hook. 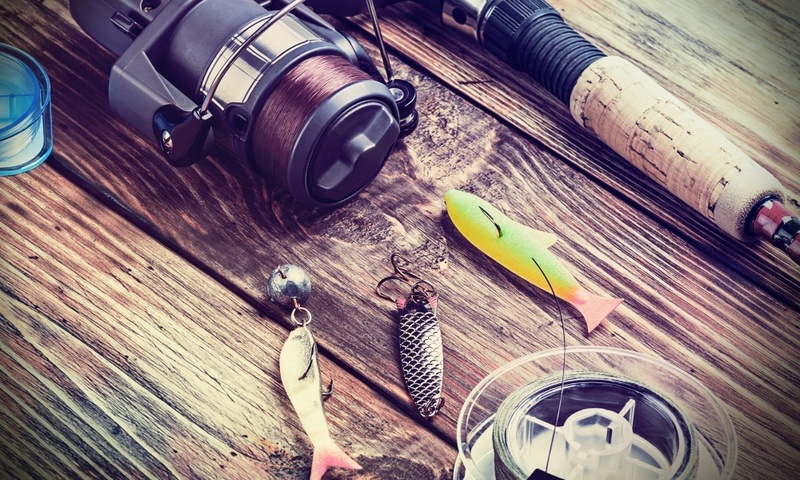 Fishing can mean different things to different people, be it as a means to survive or as a means to relieve stress but one thing’s for sure, having the right-sized fishing hook for the right size of fish means a lot, and this is what the best fishing hooks can deliver without a hitch.